“Quiet” by Susan Cain is subtitled “The Power of Introverts in a World That Can’t Stop Talking”. Cain identifies as an introvert, which she defines as someone who prefers living, socialising and working in quiet environments with little sensory stimulation (e.g. noise, lights, bright colours, lots of people talking etc) and can become stressed and unproductive if those needs aren’t met. The introversion-extroversion facet of personality was first described by Carl Jung, see here for more information and descriptions. Cain writes as an American, but the ideas in this book can be applied here in the UK. As well as reflection on her own experiences, Cain met numerous experts, introverts, extroverts, university staff, employers and psychologists. She backs up her assertions with science, providing a huge list of references. This is not a ‘fluffy’ book! Cain believes that the world is set up for extroverts (also sometimes spelled ‘extraverts’). We are bombarded with sensory stimulation and are pushed to ‘sell ourselves’ louder and more boldly than ever before. Schools and workplaces particularly are arranged to encourage big group spaces and group work. Cain believes this is great for extroverts but a nightmare for introverts – and everyone misses out as a result. Introverts can end up overwhelmed, stressed out, and unheard. In Cain’s opinion, introversion is often pathologised – which means that it is made out to be some kind of illness, or a sign that something is ‘wrong’ with you. This is incorrect! Introversion and extroversion are points on two ends of a spectrum of human behaviour and experience. Neither is ‘wrong’. 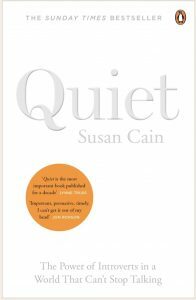 In her book, Cain shows that introversion is associated with skills and strengths that are easy to overlook – not only by extroverts but by introverts themselves. She suggests various practical ways for introverts, and their friends/relatives/loved ones/bosses/coworkers, to make the most of these skills for the benefit of everyone. Does that mean Cain dislikes extroverts, and wants everything set up for introverts? No, definitely not! The book is very clear that both extroverts and introverts have valuable skills that complement each other. Both can learn from the other, and balance is key. However, Cain also suggests that introverts may need to occasionally put on an extrovert ‘persona’ occasionally to get things done. She also suggests ways for extroverts to help their introverts friends, loved-ones and colleagues to shine. 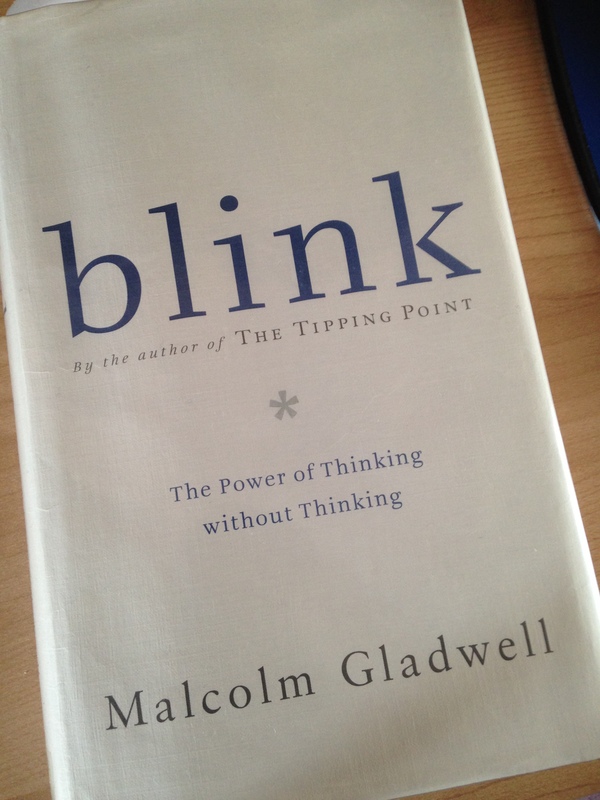 I found this book very interesting, and useful. It balances helping introverts to be more accepting of themselves and less self-critical, with advice on how to get on in this world and meet goals. Cain’s advice can help introverts to achieve what they want, without becoming someone they are not. 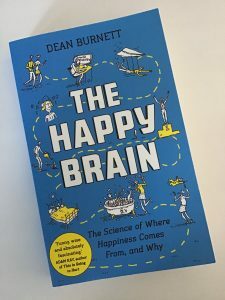 I enjoyed Dean Burnett’s first book, The Idiot Brain, which I reviewed here, so I was very pleased when The Happy Brain was announced. I loved it. This second book is, I think, even better than the first. 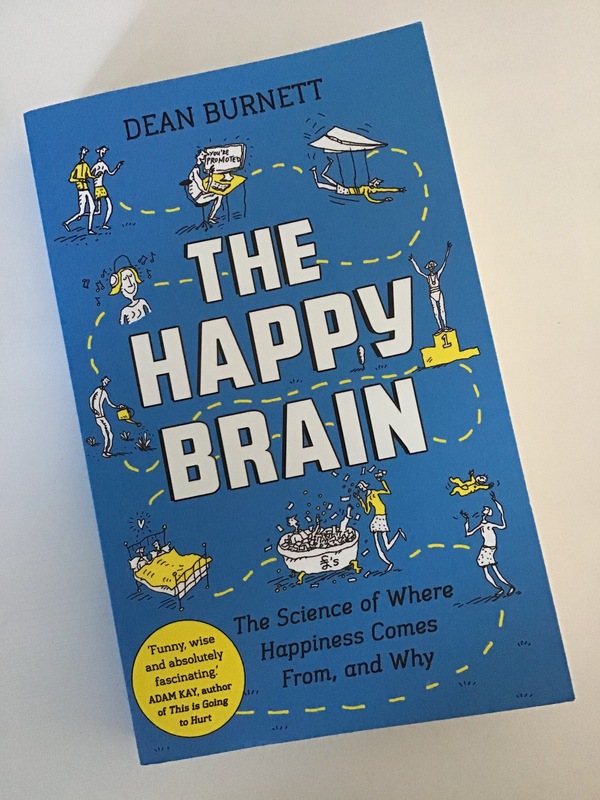 The Happy Brain is the result of Dean Burnett’s attempts to discover exactly what makes us happy. Is there a ‘secret’ to happiness, and what is it? Many people claim to know the ultimate key to being happy (and it’s always something different). So what can a neuroscientist tell us? What Burnett discovered is that the things which make us happy vary hugely person to person. Some of the reasons are evolutionary, some are social, and a lot of it is still unclear. The key point to come away with is that brains are incredibly complicated – it just isn’t realistic to simplify it down to one action or item that is guaranteed to bring us happiness. In some ways this might seem frustrating or dispiriting – after all, we all want to be happy and ideally as easily as possible. On the other hand, it is reassuring to realise that your brain is doing amazing things every day and there’s no need to rely on other people to tell you what you ‘have’ to do to be happy. Burnett carefully explains the various structures and parts of the brain, what we know about them and how we think they work. The descriptions are clear and helpful, linking brain activity to thoughts and actions we all experience. He also talked to various people about their happiness (or lack of it), and reflected on his own work and experiences. I found myself nodding along to so much of what he said, noting how many experiences are universal. Much like his previous book, The Happy Brain has a lovely chatty style. I laughed out loud at several points – Burnett’s style is breezy and fun, classically self-deprecating and enjoyable. This isn’t a self help book. It won’t give you all the answers, and Burnett explains why. What it will do is ask a lot of questions, and get you thinking. The main point I came away with is that our happiness depends primarily on other people – our interactions, our relationships, our internal model of how the world works. Sartre may have said “hell is other people”, but perhaps heaven is too? I have written about some of Matt Johnstone’s books before, and The Little Book of Resilience: How To Bounce Back From Adversity and Lead a Fulfilling Life is similar to those in many ways. Resilience is a vague concept. It’s easy to say that resilience is the ability to recover from bad events, but hard to put into practice. 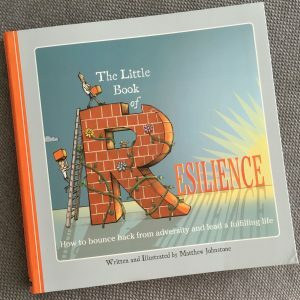 What exactly does resilience look like? What can we actually do to increase resilience? The book is divided into two parts. The first part explains what resilience is and why we need it. It provides examples of the kinds of life events which might cause us distress and why we feel how we do. The second part gives practical suggestions of ways to care for yourself and approach problems to improve resilience. As I have read elsewhere, when we feel at our lowest we tend to overestimate the threats and underestimate our resources. This book discusses both. It is worth building up and keeping aware of our resources before things happen, so they are easier to reach for when we need them. It can also help to practice seeing things with curious, non-judgemental observation so we see threats more realistically when they arise. Johnstone’s book explains how to do these things. There is also a useful list of resources and helpful organisations in the back. If we know what our immediate reactions to things are likely to be in advance, we are more ready to deal with them and remain in control in the moment. A description of negative automatic thoughts and how to recognise them can be found here. This isn’t a difficult book to read – it has short sentences and is filled throughout with the author’s charming illustrations. If you want a really meaty, in-depth book of instructions then this isn’t for you. Rather, this book is likely to be helpful and accessible when you feel overwhelmed and can’t think straight. Its simple, clear guidance is gentle and uplifting, and won’t take more than an hour or so to read. 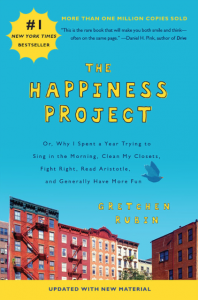 “The Happiness Project” is Gretchen Rubin’s report of her year-long exercise to increase her happiness through self-discovery and trying various activities. Rubin describes how she started with small “happiness resolutions”, with different (and more difficult) ones each month. For December, she decided to try to keep to all her resolutions from the whole year. Rubin challenged herself to find out what her ‘rules’ were and how following them (or not) changed her happiness. A part that stuck out to me was “you can’t choose what you like to do, you can only choose what you do“. What Rubin means is that forcing ourselves to do things we strongly dislike because we think we ‘should’ doesn’t increase happiness. For example, Rubin wants to be the kind of person who listens to cool jazz music rather than pop, perhaps because she feels that as an adult and professional that she ‘should’. But she doesn’t. So why did she force herself to listen to music she dislikes rather than accepting she likes what she does? Discovering this and accepting it provided a great example of how she could take control of her happiness. Of course, some tasks are unavoidable. Rubin tries to reframe them and view them in ways that don’t drag down her mood. She finds ways to see pleasure in even mundane things, until the habit becomes second nature. Rubin is flexible with her time and wealthy in a city with lots of opportunities, so her experience may seem unachievable. This book is less a “how to” guide than a “this is what I did” description. However, it might give some ideas of how to carry out your own “Happiness Project”, in ways that suit your lifestyle. What rules do you live by? What do you do because you think you ‘should’ rather than because they make you happy? Are these things you can stop, or reframe? What made you happy to do as a child (acting, painting, singing? ), and what caused you to stop? Could you start again? You can read a sample chapter of The Happiness Project here. You can read Gretchen Rubin’s blog here. 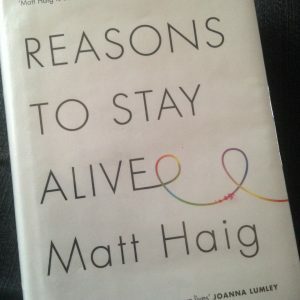 “Reasons To Stay Alive” by Matt Haig (2015, Canongate) is a non-fiction book about Haig’s development of, and recovery from, depression. I found it to be quite different from other books of this type. The writing is punchy, broken up into little chunks, and the whole thing is very easy to read. Haig chose not to have counselling or medication for his depression. He instead relied on his relationships with his family and girlfriend. Some people choose medication, some therapy, some both, some neither – there is no right or wrong answer. Not everyone has all options open to them, or wants to try everything at once. Haig went with what was right to him personally, but doesn’t criticise anyone who chooses differently. Haig describes his feelings so well, so vividly, I felt like I was right there alongside him. His descriptions of small moments of joy – and his realisation that he was experiencing those moments more often – were detailed and touching. It felt very real, very honest, and full of very gentle hope. I particularly liked the little “scripts” between himself in the present talking to himself back then, if he could time travel. 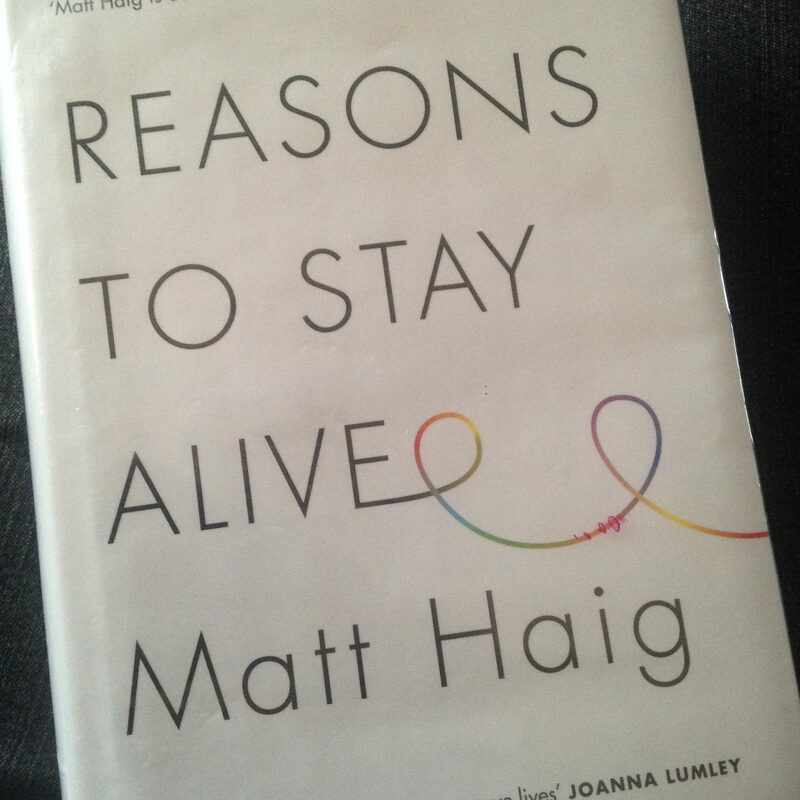 If you are suffering depression, it can seem like things will never get better – but Haig wanted to reassure himself (and the reader) ‘back then’ that they could and would. What do you think might your ‘future self’ say to you? What do you hope they might say? The section on “advice” was excellent – simple, clear ideas to try without pressure. It was particularly strong on self-care, which is something I have written about several times before. The suggestion of a breathing exercise, and the reasons for it, have inspired me to write about this for my next blog post. I would recommend this book to anyone who has depression or is trying to help a loved one through it. 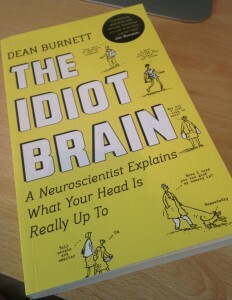 I’ve enjoyed Dean Burnett’s Guardian column for a while, so I looked forward to reading his first book, The Idiot Brain. Overall, I enjoyed the book very much. It is laid out in sections corresponding to different aspects of how the brain works, but clearly shows by careful linking of material that the brain isn’t that straightforward – the interactions between the various parts and processes can have some fascinating (and sometimes rather amusing) results. Dean Burnett writes as though he is talking to you, which makes the text clear and straightforward. 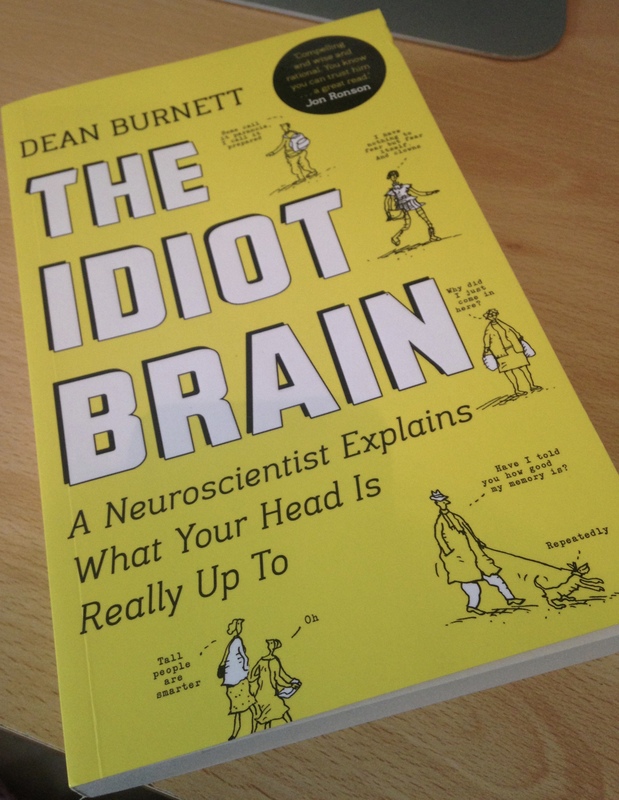 There are sections which describe the specific structures in the brain and neurological interactions which might be a little difficult to get to grips with, but not knowing what some of these things are will in no way stop a reader from understanding the concepts Burnett is explaining. Links to ordinary experiences we have all had helps this book be very relevant to what actually happens in everyday life, and could be an excellent springboard if you would like to study further (the reference list is excellent). Naturally I was most interested in the chapter on mental illness, which Burnett covers not just in terms of the scientific/medical model, but also in a very human way. Burnett’s compassion for people who have mental health problems including (but not limited to) depression, anxiety and schizophrenia really shines though the text. Understanding what is going on in the brain, and how it may have arisen, could be very helpful for someone who is struggling with their own metal illness or that of a loved-one. Some of the psychological experiments described were ones I was already familiar with, and some I was not – so this book could also be a good introduction the history of psychological study. The section on personality testing was eye-opening, although I would have liked the text to expand a bit more on the Dean’s thoughts on the usefulness (or otherwise) of the widespread use of Myers-Briggs personality testing in the corporate world – especially as this was an area I specifically looked at during part of my training. “I Had A Black Dog” is written by a man with depression, and is presented as an illustrated work with not much text. It’s Johnstone’s way of visually expressing what depression felt like for him, and I think it gets this across very well. It covers thoughts, feelings and behaviours in a sensitive and clear way – and there is even some humour. The “black dog” of the title comes from the way that Winston Churchill described the depressive phases of his bipolar disorder. The image of a large, uncontrollable, dark animal that slobbers over everything and destroys peace through size, ineptness and stubbornness is a useful image to many people. This dog isn’t deliberately vicious, or evil… just there. More Clifford The Big Red Dog than Cujo. Like Clifford the Big Red Dog, the black dog can be lived with and managed – this book ends on a note of hope for the future while not glossing over the reality. I highly recommend both this book, and the follow-up (“Living With A Black Dog” by Matthew and Ainsley Johnstone), to anyone who has depression or is trying to help someone who has it. This is another book I borrowed from the library. It made inspiring but frightening reading. I am glad that Natascha Kampusch felt able to tell her story, and I hope she found the process helpful. I learned a lot from this book about her own experience not only of being abducted and held, but also her thought processes and behaviours which enabled her to survive her ordeal. That is the message in the book that seemed most important to me – that Ms Kampusch has the best insight into how she survived and what the effects have been, and how she feels that other people diagnosing her with “Stockholm Syndrome” are viewing her experiences from their point of view rather than hers. I think this is really important – the autonomy she feels is being denied her when people describe her response to abnormal and traumatic events by giving her a diagnosis which she believes is not correct, and their dismissal of and refusal to listen to her when she says so. This is an excellent interview in which she explains her view. I do recommend this book, although I would warn that the descriptions of the violence and abuse she experienced can be harrowing.